Socrates was one of the few teachers who actually died for his craft, executed by the Athenian authorities for supposedly corrupting the young. Most learning professionals will have heard of the ‘Socratic method’ but few will know that he never wrote a single word describing this method, fewer still will know that the method is not what it is commonly represented to be. How many have read the Socratic dialogues? How many know what he meant by his method and how he practised his approach? Socrates, in fact, wrote absolutely nothing. It was Plato and Xenophon who record his thoughts and methods through the lens of their own beliefs. We must remember, therefore, that Socrates is in fact a mouthpiece for the views of others. In fact the two pictures painted of Socrates by these two commentators differ somewhat. In the Platonic Dialogues he is witty, playful and a great philosophical theorist, in Xenophon he is a dull moraliser. That the teacher should be an intellectual midwife to people’s own thoughts is his great educational principle. His mother was indeed a midwife and he was among the first to recognise that, in terms of learning, ideas are best generated from the learner in terms of understanding and retention. Education is not a cramming in, but a drawing out. What is less well known is the negative side of the Socratic method. He loved to pick intellectual fights and the method was not so much a gentle teasing out of ideas, more the brutal exposure of falsehoods. He was described by one of his victims as a ‘predator which numbs its victims with an electric charge before darting in for the kill’, even describing himself as a ‘gadfly, stinging the sluggish horse of Athens to life’. He was roundly ridiculed in public drama, notably by his contemporary, Aristophanes in Clouds, where he uses the Socratic method to explore idiotic ideas using petty, hair-splitting logic. 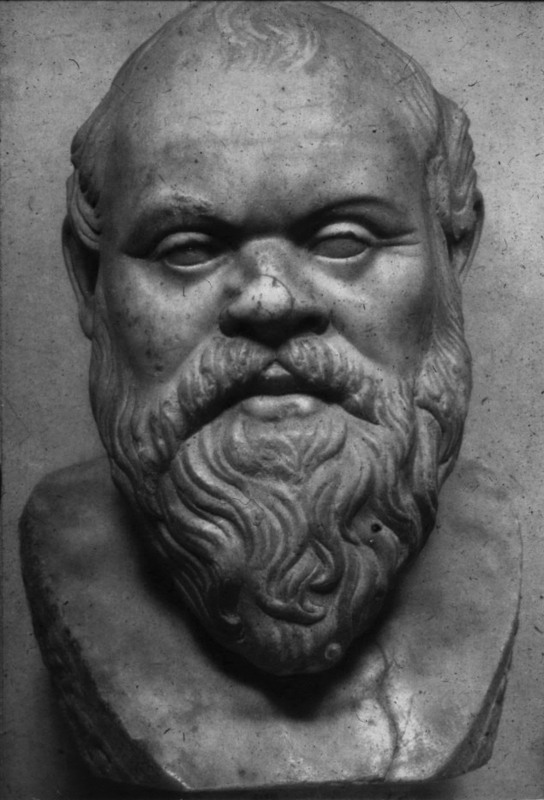 This negative side of Socrates is well described by Woodbridge in The Son of Apollo, ‘Flattery, cajolery, insinuation, innuendo, sarcasm, feigned humility, personal idiosyncrasies, browbeating, insolence, anger, changing the subject when in difficulties, faulty analogies, telling stories which make one forget what the subject of the discussion was’. His great joy was simply pulling people and ideas to pieces. We must realise the extent of our ignorance. In practice, these noble aims were marred by a spitefulness. He would claim that he taught nothing as he had nothing to teach, but this conceals his true desire to overcome and intellectually destroy his opponents. His lasting influence is the useful idea, that for certain types of learning, questioning and dialogue allows the learner to generate their own ideas and conclusions, rather than be spoon-fed. This has transformed itself into the idea of discovery learning, but there have been severe doubts expressed about taking this method too far. We wouldn’t want our children to discover how to cross the road by pushing them out between parked cars! The Socratic method, although quoted widely, is often no more than a teacher using the occasional open or inductive question. In fact, when used crudely it can frustrate learners, especially when not combined with genuine dialogue and feedback. To ask open questions about facts can be pointless and result in those awful classroom sessions where the teacher asks a question, hands shoot up and a few can answer the question. When used well, however, especially in subjects such as philosophy and for uncovering conceptual clarity in other subjects, it has lots to offer. In e-learning, Roger Schank has taken the method forward into designs based on questions which access indexed content, especially videos. One could also argue that search based inquiry through Google and other online resources allows the learner to apply this questioning approach to their own learning, Socratic learning without a Socratic teacher. Intelligent tutors and adaptive learning systems, like Cogbooks, truly account for where the learner has come from, where they’re going and what they need to get there. Sophisticated e-learning is allowing us to realise the potential of a scalable Socratic approach without the need for one-to-one teaching. Interestingly, it is only in the last few decades, through the use of technology-based tools that allow search, questioning and now, adaptive learning, that Socratic learning can be truly realised on scale. As someone who abhorred didactic, talk and chalk teaching and learning, Socrates would be appalled at current education and training. He was not an institutional figure, practiced his teaching in the public space of the Agora and thought that experts were normally fooling themsleves by believing they had the knowledge to impart to their students. It is the unexamined life that is not worth living but not the life of certainty. .
Of course, if we were to behave like Socrates in the modern school, college, university or training room, we’d be in front of several tribunals for bullying, not sticking to the curriculum and failing to prepare students for their exams. Not to mention his pederasty. (We can perhaps put this to one side as a feature of the age!) So think again when you use the phrase ‘Socratic method’, it’s not what it seems! Donald, enjoyed learning about the 'real' Socrates, especially your final paragraph stating what would happen if we taught like Socrates today. From reading this I suspect that Socrates was not the best model for the Socratic method! I wrote a blog post myself earlier this year in reply to another discution that was going on. The post was about a great session on and using the Socratic Metod by Win Wegner. Thank you for the stimulation, mid-morning in Seattle. Robert Rogowski sent you my way. Interesting. I am curious about the text on Socrates. "‘predator which numbs its victims with an electric charge before darting in for the kill"
Electric ... in ancient Athens? You wouldn't happen to remember the source of that? Actual Greek word is αἰολοβρέντας which literally means 'with a thunderbolt', but translators like to make things relevant and colloquial. No wonder it is useful in the courts but in everyday conversation I have often thought the Socratic method a bit pants. People who indulge in it usually seem to me to have poor self-esteem and hide behind the system but hey, that's easy to unpick but a common observation. 2) It allows you to publicly dominate the conversation for the same reasons and if something is thrown up to be able to exploit weaknesses in logic and do some obvious swanking.